In addition to air traffic control services, Naviair also provides alerting services and flight information service. Copenhagen Information (COIF) provides Naviair’s special Flight Information Service (FIS) to pilots who are flying under Visual Flight Rules (VFR) in Danish airspace. Copenhagen Information is staffed 24 hours a day and is physically located in the control center in the Naviair facility at Copenhagen Airport. Copenhagen Information services a large number of Danish and foreign aircraft every day. Every aircraft in the air is flying either under Instrument Flight Rules (IFR) or Visual Flight Rules (VFR). By far the majority of commercial flights with passengers or freight fly under Instrument Flight Rules (IFR). Here the aircraft navigates in the air exclusively with the aid of instruments and can therefore fly even in poor weather. At the same time the aircraft is under constant monitoring by air traffic controllers, which means that the aircraft is watched continually from Naviair’s control center at Kastrup as long as it is in Danish airspace. Because a fee is charged for flights under Instrument Flight Rules, small aircraft, in particular, often fly under Visual Flight Rules (VFR). Here it is up to the individual pilot to navigate in the air and avoid collisions with other aircraft, obstacles on the ground, and flying into restricted areas. 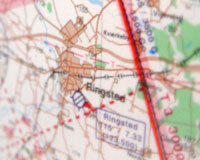 Flight under VFR can therefore take place only when the weather meets specific requirements. Aircraft flying under VFR, however, also need information, and this is where Copenhagen Information comes into the picture. Copenhagen Information gives advice and guidance directly to pilots flying under VFR in Danish airspace and in this way helps individual pilots with air navigation. Copenhagen Information also provides information concerning weather, altimeter settings, radio frequencies, etc. Copenhagen Information is staffed by certified air traffic controllers. More than 35 persons have completed special training concentrating on providing Flight Information Service. There is also ongoing additional training in order to meet our customers’ requirements and desires. In addition to Flight Information Service, work at Copenhagen Information also includes alerting services. All flights with flight plans have alerting services from take-off to landing. If the aircraft does not arrive at its destination on time, the alerting service is set in motion. A search is started 15 minutes after planned arrival and after half an hour a supervisor in the Joint Rescue Coordination Center (JRCC) in Aarhus is notified, who thereafter takes over the search with the help of police and/or rescue helicopters, if required. In addition to general alerting services, Naviair also provides route alerting services, for example for flights across major overwater routes. Here the pilot reports the planned route and when he or she expects respectively to leave or reach the coast. Copenhagen Information then follows up on this information and ensures that the aircraft does not have an accident without being searched for.